I was recently sent some super cute maternity tops and a onesie from Gladditudes. Gladditudes is a company that makes happy t-shirts for moms-to-be, dads, babies, teens, etc. When I saw their cute maternity tops, I knew that I wanted to try out some of those. 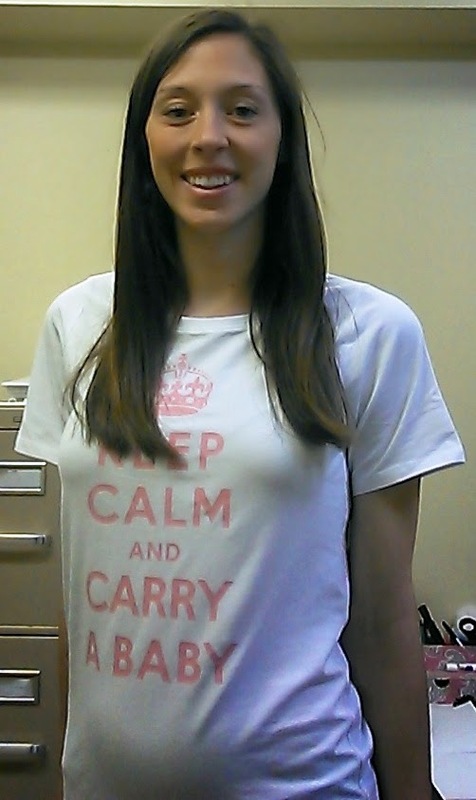 I chose the top that says "Keep Calm and Carry a Baby". I wore this to work on a casual jeans day and love it! The shirt is so nice and long that it should fit me until the end of my pregnancy. It is stretchy too and a very nice material. I got so many compliments on this shirt! The little "Made with Love" onesie is adorable! I love this nesting shirt as well. These shirts come in all different sizes and I think would be great earlier in the pregnancy with a pair of leggings while the top is still long. Then later on, it will seem shorter because of the expanding belly. The colors are customizable on these shirts as well. I chose a hot pink color in this one for fun.The shirts are about in the $25 range. Gladditudes specializes in the maternity skeleton t-shirts but I did not choose one of those since I am not pregnant around Halloween but they are very cute! The shirts from Gladditudes are very soft and can fit an expanding belly very well. I love their cute sayings and unique designs.